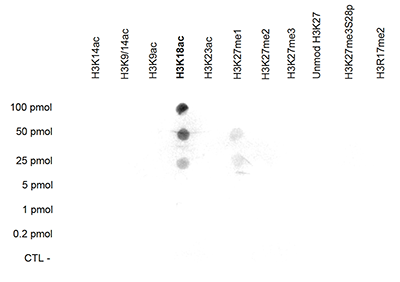 This antibody has been raised against histone H3 containing the acetylated lysine 18 (H3K18ac), using a KLH-conjugated synthetic peptide. To determine the titer, an ELISA was performed using a serial dilution of the Diagenode antibody directed against H3K18ac (Cat. No. CS-139-100). The antigen used was a peptide containing the histone modification of interest. By plotting the absorbance against the antibody dilution (Figure 1), the titer of the antibody was estimated to be 1:8,800. 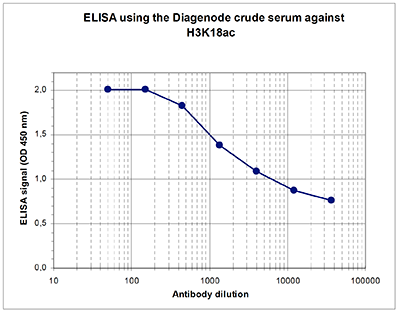 A Dot Blot analysis was performed to test the cross reactivity of the Diagenode antibody against H3K18ac (Cat. No. CS-139-100) with with peptides containing other modifications and unmodified sequences of histone H3. One hundred to 0.2 pmol of the peptide containing the respective histone modification were spotted on a membrane. The antibody was used at a dilution of 1:1,000. Figure 2 shows a high specificity of the antibody for the modification of interest. 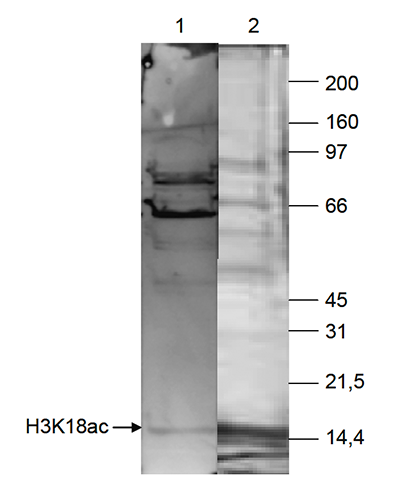 HeLa cells were treated with butyrate and histone extracts (15 μg) were analysed by Western blot using the Diagenode antibody against H3K18ac (Cat. No. CS-139-100) diluted 1:250 in TBS-Tween containing 5% skimmed milk (lane 1). Lane 2 shows a coomassie blue staining of the gel. The position of the protein of interest is indicated on the left; the marker (in kDa) is shown on the right. Diagenode strongly recommends using this:	H3K18ac polyclonal antibody - Classic (Diagenode Cat# C15310139 Lot# A612-001 ). Click here to copy to clipboard. Molecular analysis of enhancer RNAs and chromatin modifications in the region of their synthesis in Drosophila cells possessing genetic constructs.